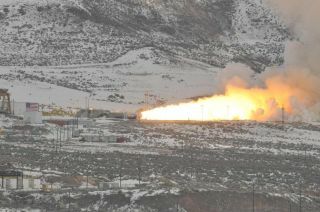 The final test firing of a reusable space shuttle solid rocket motor, called FSM-17, occurred on Feb. 25, 2010 in Promontory, Utah. PROMONTORY, UTAH - Thethunderous roar from a space shuttle solid rocket booster reverberatingand rebounding off the mountains of northern Utah was heard forthe final time Thursday, as NASA and contractor Alliant Techsystems(ATK) ignited their final ground test after three decades of staticfirings. The 52nd reusable solid rocket motor (RSRM) ground test since thefirst was fired July 18, 1977, the two minute and three second horizontal "launch" wasperformed in support of NASA's remaining four missions before the shuttlefleet is retired later this year. "That was probably the safest solid rocket motor ever test firedhere," commented Steve Cash, NASA's manager for the shuttlepropulsion office. "I have a lot of comfort about this coming next[four] launches because of the test firing today." "This is really the celebration of 33 years," added DavidBeaman, NASA's manager for the RSRM office. "We have been testingsince July 1977 here. This was the 52nd test and the reason we testis to make sure we are safe." A totalof 43 design objectives were measured during the test, including ensuringthat the final shuttle motors were safe to launch astronautsand qualifying the performance of minor upgrades to materials,according to ATK, NASA's prime contractor for the solid rocket boosters. "I would like to report that initial test data is looking reallygood," Charlie Precourt, ATK's vice president and general manager forspace launch systems, told the media soon after the test wascompleted. The data collected from the four-segment booster test will also aid in thecontinued development of the five-segment booster that was tofly as the first stage for Ares, NASA's planned replacement forthe shuttle. Despite being calledfor cancellation by President Obama earlier this month aspart of the space agency's Constellation program to return astronauts tothe moon, the second five-segment Ares I ground test isstill scheduled for September. Thursday's final shuttle test attracted an estimated 5,000public spectators, more than twice the audience for earlier firings.In addition to children from local schools, the test also drewin officials from across NASA's shuttle program, including a handfulof former and current astronauts who rode the solid rocket boostersto space. "Riding on [the space shuttle] is fun, it's exciting," sharedKent Rominger, a five-flight shuttle commander who now serves as ATKSpace Systems Group's vice president for test and researchoperations. "When you watcha shuttle launch, to me it's always been anemotional experience." "Hereit is different, 'cause hopefully nothing goes into the air other thanthe exhaust plume but you're actually closer to it," he told collectSPACE.com. "Youget to see it, then hear it, so you get a sense what the speed of sounddoes for you and then the noise is obviously very pronounced and againit's an exciting, kind of a 'gee whiz' sort of moment. So that's a prettyamazing three million pounds of thrust we watch for acouple of minutes." For most of the morning, it appeared as though the view Rominger describedwould remain mostly hidden behind a dense fog that rolled in over thesnow-covered mountains surrounding the test area in Promontory, Utah. By11:50 a.m. MST, when the countdown reached zero however most of thefog had lifted, giving the spectators a show. "This is a little bit bittersweet," reflected Beaman referring tothe test, "but sometimes the celebration in completing something, inflying out a mission, that is really something we don't appreciateor understand until we are near the end of the program." Sincebeing redesigned after the Challengeraccident and returning the shuttle to flight for the first time in1988, 210 solid motors have flown with 105 shuttle missions. Thirty-four(34) ground tests were conducted in the same period, enabling ATK tooptimize the RSRM before integrating the changes with flight hardware. "A lot of us went through Challenger, we made changes there," said Cash. "We continued to improve the safety of this solid rocket motor overthe last 30 years, and seeing that culminate in this final test was ahappy time and also a little bit of a sad time." I am not going to kid you. I walked away saying 'Boy, I'm sure goingto miss this testing,'" he admitted during the post-test pressconference. The loss of space shuttle Columbia in 2003 resulted in the decisionto retire the shuttle system after completing the InternationalSpace Station (ISS) in 2010. "People have dedicated their entire lives to this program. There'sa lot of people who have in essence grown up and grown old inthis program. It is bittersweet. It's nice to be able to say thatwe've gotten to a point where we are going to complete something," reflected Beaman. "It is bittersweet thinking about the program ending," he said. Clickthrough to collectSPACE.com for HD video and more photographsfrom the solid rocket booster ground test. Video ? What's Next For NASA?